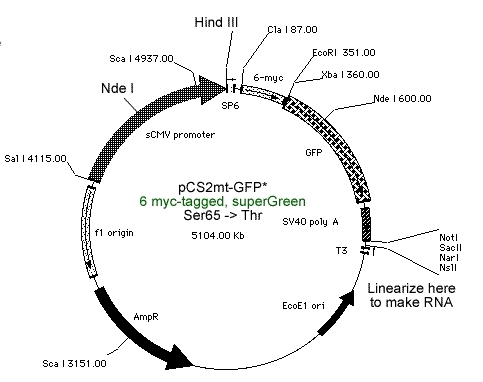 The pCS2 plasmid can be used to synthesize RNA via its SP6 promoter, or directly drive expression in eukarotic cells via the CMV promoter. 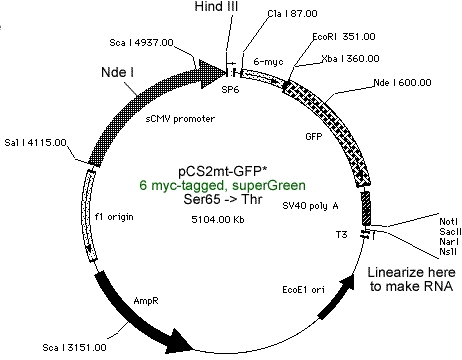 In pCS2mt-GFP, the S65T mutant form of GFP has been inserted such that the myc tags and the GFP are in-frame. You can subclone your favorite sequence between the myc tags and the GFP using EcoRI and Xba I sites. The EcoRI site's AAT defines the reading frame for the insert. 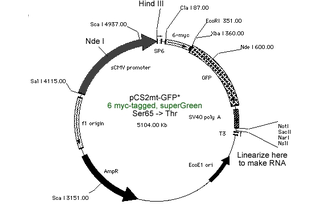 This produces an N-terminally myc-tagged, C-terminally GFP-tagged chimeric polypeptide.